Abigail Marsh is a designer-maker and silversmith with a first class degree in BA (Hons) Jewellery at the University for the Creative Arts, Farnham and is currently an Artist in Residence at the university. With the main focus of the specialist craft of silversmithing, Abigail’s unique and one-off pieces celebrate the material, silver. 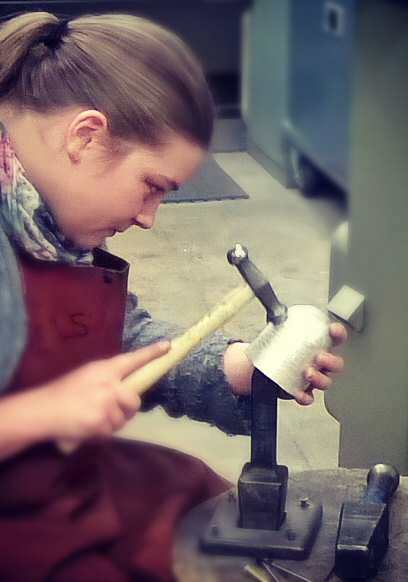 Using traditional methods of making in a contemporary way Abigail’s work celebrates the real craftsmanship of silversmithing and the skill of the maker’s hand to its best. It was at university where Abigail’s passion for hand raising was discovered. Abigail found the process of growing a piece from a sheet of metal to be breath-taking. This method of making has gone on to inform many of Abigail’s designs and pieces. Her exploration and variation of this skill has allowed her to push the boundaries of the material, testing its limits, and to create new and exciting ideas for contemporary silverware. Jewellery is on display in the Craft Study Centre, Farnham. Abigail’s Connecting Hand Jewellery is on display and for purchase at the Craft Study Centre. For more information about the center please click here. ‘Artwave’ – Jonathan Swan’s Jewellery Workshop. The Workshop Lewes, 18th August – 2nd September 2018 For more information please click here. ‘New Designers’ – Business Design Centre, London, N1, Part 1 27th-30th June 2018 For more information. ‘Graduation Show’ – University for the Creative Arts, Farnham 7th-15th June 2018 For more information please click here. ‘Inspired’ – The Festival of Silver at The Goldsmiths’ Centre, 3rd-6th May 2017 For more information please click here.